Darren Naish: Tetrapod Zoology: When whales walked the land… and looked like antelopes… and mimicked crocodiles…. and evolved trunks. What? When whales walked the land… and looked like antelopes… and mimicked crocodiles…. and evolved trunks. What? Note for visiting cryptozoologists (added December 2006): nowhere in this article do I say that remingtonocetids might have had trunks. Rather, the reference to a trunked whale refers to Makaracetus bidens, an unusual Pakistani protocetid described in 2005. More details on it in future (for the latest news on Tetrapod Zoology go here). Everybody interested in animals is, I assume, fascinated by whales, and one of the most interesting topics in mammal evolution surely has to be the evolution of whales from their terrestrial ancestors. As a relatively well documented macroevolutionary tale (Thewissen & Bajpai 2001), the transition integral to this story is informative on so many levels (see Carl Zimmer’s At the Water’s Edge for a good, though now dated, overview). For me, the early evolution of whales has become particularly interesting for two reasons. Firstly, it’s controversial, and particularly so within recent years. A cherished idea of cetacean affinities – namely, the notion that whales descend from mesonychians – has been usurped by the originally unpopular and crazy notion that whales might be close relatives of hippos. Secondly, it’s an area illuminated by novelty: specifically, by lots of newly recognised taxa. It turns out that Eocene taxa, the so-called archaeocetes, weren’t just seal-shaped amphibious protowhales: they were a motley assortment that got up to all sorts of things. Believe it or not, they included saltatorial deer-like forms, macropredatory crocodile-mimics, diminutive long-tailed forms that looked like giant desmans, ‘megaseals’ and forms sporting tapir-like trunks. Several of the taxa I have in mind are new (as in, published in 2004 or 2005), and already a review article I wrote on basal cetaceans (Naish 2004) is out of date. Though basal whales less specialised for aquatic life than modern forms had been known since the 1830s (these being basilosaurids and dorudontids), it was only in 1904 that fossil whales truly reminiscent of their terrestrial ancestors were discovered. Two new species from Lutetian (middle Eocene) rocks of Egypt, Protocetus atavus and Eocetus schweinfurthi, were described by Eberhard Fraas in that year. With their geological antiquity (they were, at the time, the oldest of all whales), relatively small body size (3-4 m, compared to 5-20 m for basilosaurids and dorudontids), and teeth and vertebrae more similar to those of typical land mammals than to those of other whales, they were clearly the most primitive of all whales then known and were deemed worthy of their own new family, Protocetidae Fraas, 1904. However, exhibiting an elongate rostrum and uniquely shaped dense-boned ear capsules, they were clearly still members of Cetacea. Numerous discoveries of fossil whales similar to Protocetus and Eocetus have since shown that protocetids and their relatives experimented with a variety of lifestyles in and adjacent to the marine environment. Discoveries of Protocetus-like material in North America (Kellogg 1936) also show that these animals were geographically widespread. During the 1970s and 80s emphasis in basal whale research began to shift from Africa to Asia, at first because Sahni & Mishra (1972) described primitive whale remains discovered in India, and later as West (1980) figured and identified lower jaw specimens from Pakistan. Sahni & Mishra (1972) regarded their material as representing two new species of Protocetus, P. sloani and P. harudiensis, the new taxon Indocetus ramani, and two new basal odontocetes, Andrewsiphius kutchensis and A. minor. Their Protocetus species have since been shown to be referable to a new genus that is part of a newly recognised, highly unusual basal whale group, Remingtonocetidae (Kumar & Sahni 1986). Andrewsiphius also proved to be a remingtonocetid. West (1980) also named a Pakistani specimen as a new species of Protocetus - P. attocki (but see below) - and also formalised previous suggestions that two tooth-based Pakistani mammals, Ichthyolestes pinfoldi and Gandakasia potens, were not mesonychians, as they had been originally described, but basal whales. By now, the number of Asian basal cetacean taxa had exceeded the African count. The next most significant basal cetacean discovery was announced in 1981 when Gingerich & Russell (1981) described the well preserved but incomplete skull of the new genus and species Pakicetus inachus. West’s P. attocki proved to be a second species. With a number of unique cetacean ear bone characteristics, Pakicetus was interpreted as a probably amphibious predator that was transitional between terrestrial, wolf-like mesonychians, the probable ancestors of whales (or so it was thought at the time), and larger, younger archaeocetes like the basilosaurids. The ear bones of Pakicetus are uniquely intermediate between those of land mammals and those of derived cetaceans (Gingerich et al. 1983) and, coupled with its presence in shallow freshwater environments, suggest that it was not yet a fully marine animal. With only a partial skull to go on, Pakicetus was assumed to be seal-like, and conventional life restorations depict it that way. We now know that these restorations are wildly inaccurate, as associated pakicetid skeletons show that these mammals weren’t all that different, superficially, from basal ‘slinker-type’ artiodactyls such as chevrotains, small deer and basal Eocene forms (Thewissen et al. 2001). In fact we also now know that pakicetids had the double-pulley astragalus regarded as unique to artiodactyls, so now it seems that artiodactyls and cetaceans were closer to one another than cetaceans were to mesonychians. Far from being seal-like protowhales, pakicetids – the most basal members of the cetacean radiation – were more like carnivorous little antelopes, though presumably they spent at least some time in shallow water. After Pakicetus, perhaps the most important basal whale discovery was that of Ambulocetus natans, a Pakistani whale a few million years younger than Pakicetus (Thewissen et al. 1994). With a dorsoventrally mobile back and huge, long-toed feet, Ambulocetus appears suited for competent movement on land, but probably swam by powerful up-and-down oscillation of the back and paddling with the hindlimbs. Its elongate tail was not powerfully muscled and does not have the special square-shaped vertebrae required to support a tail fluke. In contrast to pakicetids, Ambulocetus had a narrow snout and laterally directed orbits, relatively short legs, and an overall robust skeleton. An intriguing possibility regarding the palaeobiology of Ambulocetus is that it was a crocodile-like ambush predator that stalked prey while concealed in shallow water (Thewissen et al. 1996). This conclusion is based on the crocodile-like skull of Ambulocetus: both groups have long but robust snouts, pointed teeth, strong jaw-closing muscles and eyes located high up on the head. Ambulocetus also exhibits unusual and extensive tooth wear which indicates that it fed on bony prey. If the crocodile analogy is viable, what might Ambulocetus have preyed on? Anthracobunids, a group of herbivorous ungulates probably related to elephants, and sirenians both lived in the same environments as Ambulocetus. Thewissen et al. 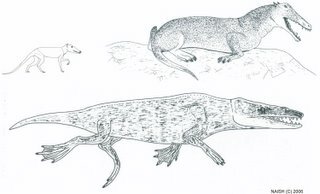 (1996) suggested that Ambulocetus might have preyed upon these animals, as well as other animals that may have approached the shoreline. However, given that large crocodiles were already common in the marine and freshwater environments frequented by Ambulocetus, this theory has a flaw. Indeed, it has been pointed out that primitive cetaceans may have suffered from extensive crocodilian competition and predation. Perhaps, therefore, Ambulocetus selected environments where crocodiles were very rare or absent. The discovery of Ambulocetus and other new basal whales has shown that they can’t all be shoehorned into an all-encompassing Protocetidae. Rather, they should be classified as several distinct groups. Pakicetus and its close relatives were given their own group, Pakicetinae, by Gingerich & Russell (1981), and this has more recently been raised to the level of ‘family’. Besides Pakicetus, Ichthyolestes pinfoldi and Nalacetus ratimitus are included. Thewissen et al. (1996) coined Ambulocetidae for Ambulocetus, and it seems that Gandakasia and Himalayacetus are also members of this group. Remingtonocetidae was named by Kumar & Sahni (1996) for Remingtonocetus and Andrewsiphius, two very peculiar long-snouted middle Eocene whales from India and Pakistan. Andrewsiphius had previously been regarded as an odontocete on the basis of its elongate and compressed lower jaw (Sahni & Mishra 1975). However, this referral was not defensible as, like archaeocetes and unlike odontocetes, Andrewsiphius had a primitive style of tooth count, relatively deep lower jaws, and intermittent gaps between the teeth. Remingtonocetids are also odd in having a particularly long, slender snout and widely set small eyes. The most informative of them is little Kutchicetus minimus (Bajpai & Thewissen 2000), the smallest known Eocene whale*. It shows that remingtonocetids had short, stout limbs, a long, sinuous body and a remarkably long tail. I like to think that it looked like a giant desman, but that only helps if you know what a desman is. * Though note that not all early whale experts agree that it is distinct from Remingtonocetus. Finally, there are the middle and late Eocene protocetids. In the interests of getting this post completed and posted now, I’ll stop there. I have children to look after. Three of them (though only one is mine). More to come on basal whales in the near future. Bajpai, S., Thewissen, J. G. M. 2000. A new, diminutive Eocene whale from Kachchh (Gujarat, India) and its implications for locomotor evolution of cetaceans. Current Science 79, 1478-1482. Gingerich, P. D. & Russell, D. E. 1981. Pakicetus inachus, a new archaeocete (Mammalia, Cetacea) from the Early-Middle Eocen Kuldana Formation of Kohat (Pakistan). Contributions from the Museum of Paleontology, University of Michigan 25, 235-246. - ., Wells, N. A., Russell, D. E. & Ibrahim Shah, S. M. 1983. Origin of whales in epicontinental remnant seas: new evidence from the Early Eocene of Pakistan. Science 220, 403-406. Kellogg, R. 1936. A review of the Archaeoceti. Carnegie Institute of Washington Publication 482, 1-366. Kumar, K. & Sahni, A. 1986. 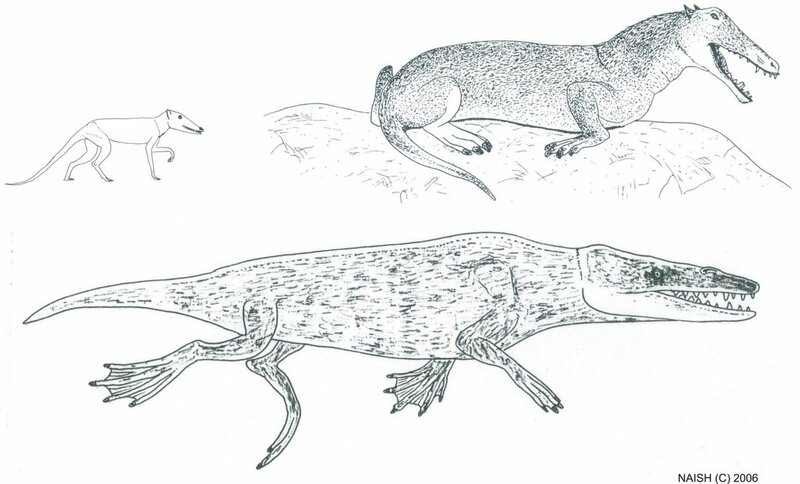 Remingtonocetus harudiensis, new combination, a Middle Eocene archaeocete (Mammalia, Cetacea) from western Kutch, India. Journal of Vertebrate Paleontology 6, 326-349. Naish, D. 2004. Fossils explained 46. Ancient toothed whales. Geology Today 20 (2), 72-77. Sahni, A. & Mishra, V. P. 1972. A new species of Protocetus (Cetacea) from the Middle Eocene of Kutch, western India. Palaeontology 15, 490-495. Thewissen, J. G. M. 1998. Cetacean origins. Evolutionary turmoul during the invasion of the oceans. In Thewissen, J. G. M. (ed) The Emergence of Whales. Plenum Press (New York), pp. 451-464. - . & Bajpai, S. 2001. Whale origins as a poster child for macroevolution. BioScience 51, 1017-1029. - ., Hussain, S. T. & Arif, M. 1994. Fossil evidence for the origin of aquatic locomotion in archaeocete whales. Science 263, 210-212. - ., Madar, S. I. & Hussain, S. T. 1996. Ambulocetus natans, an Eocene cetacean (Mammalia) from Pakistan. Courier Forschungsinstitut Senckenberg 191, 1-86. West, R. M. 1980. Middle Eocene large mammal assemblage with Tethyan affinities, Ganda Kas region, Pakistan. Palaeontology 54, 508-533.
Zimmer, C. 1998. At the Water’s Edge: Macroevolution and the Transformation of Life. Free Press (New York), pp. 290. I'm posting this on behalf of Carl Buell. He made this comment in an email sent to me in Feb' 2006, sorry I didn't post it sooner Carl. Great review of the whales. I remember when I first saw the material for Kutchicetus. I drew it, but I'm still not sure I believe it. What a bizarre and wonderful creature it must have been. I think that the desman is a fine analogy as long as you lengthen the rostrum and add a whole flattened otter to the back end as a tail.